LAWRENCE — For 87 days starting April 20, 2010, oil flowed freely into the Gulf of Mexico after a deadly explosion rocked the Deepwater Horizon oil drilling rig operating in the Gulf of Mexico. The disaster spoiled the environment in large parts of the Gulf Coast of the U.S., imperiling communities that rely on Gulf waters for trade and tourism. Now, a $590,000 grant from the National Academies’ Gulf Research Program will enable a researcher at the University of Kansas to study community cohesion and recovery after the spill. So-Min Cheong, associate professor of geography, has previously earned an NSF CAREER grant to investigate changing environmental disasters and community adaptation in coastal Louisiana. Much of her scholarship focuses on disaster management, community adaptation and climate change. Her new work with colleagues Larry Crowder and Jacob Model of Stanford University and Kristy Lewis of St. Mary’s College will focus on sociological and ecological influence on communities’ response to the Deepwater Horizon spill and the role of nonprofit organizations in boosting “community cohesion” after the spill. She hopes to reveal the social-ecological drivers of response and current extent of recovery in approximately 92 communities, using data and methods from disciplines including geography, marine ecology and management, and investigating sectors such as oil, fisheries and tourism. Cheong and her collaborators will parse 38 types of data for each community and synthesize the information to make it more useful. Cheong said there was a gap in knowledge about the influence of nonprofits on community cohesion following a disaster like Deepwater Horizon. She hopes work performed under the new grant will shed light on how nonprofits play a role in how communities shape themselves following disaster and how important that role could be. The results of the research will be made public on a website and shared in scholarly articles in prominent peer-reviewed journals. Most importantly, lessons learned will be shared with leaders in communities still recovering on the Gulf Coast. Guiding the recovery and sharing best practices are the ultimate objective of the grant, according to the National Academies’ Gulf Research Program. Cheong said her work in the Gulf would inform her participation within the Intergovernmental Panel on Climate Change, the UN-based organization that publishes global climate assessments. Following a rigorous selection process, Cheong was among the scientists picked to contribute to past IPCC reports on climate extremes and its fifth assessment, and recently called upon to help outline an upcoming special report on oceans and cryosphere. The IPCC is beginning a new cycle in preparation for the sixth assessment report, and this special report is part of this new cycle. 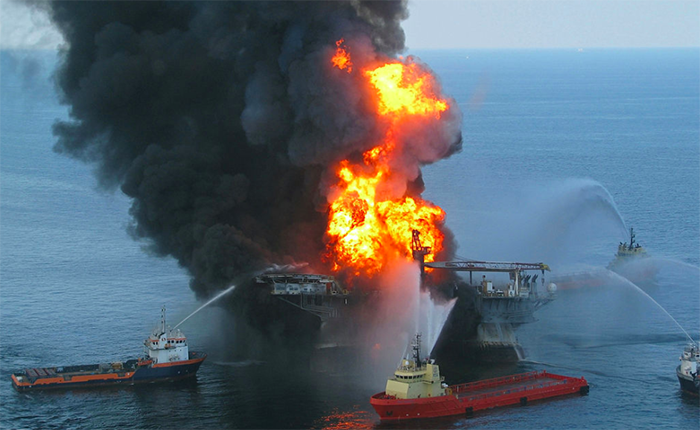 Photo: Platform supply vessels battle the blazing remnants of the off shore oil rig Deepwater Horizon in this April 20, 2010, file photo by the U.S. Coast Guard.